We have a strong track record for nurturing gifted photographers. We encourage inventive approaches to image making, helping you to become a highly creative, technically experienced professional. With its outstanding reputation for nurturing new talent, our BA Photography will help you become a highly creative, technically experienced professional. You’ll develop imaginative approaches to image making which will set you apart within the creative, media and arts industries.This Photography course is centred upon your development as a well-informed and highly creative photographer. You will be encouraged to challenge conventions, break moulds and create your own photographic identity. The School of Arts has a long-standing reputation for excellence in the field of photography. Our state of the art facilities are the envy of many experienced professional photographers. We offer a free equipment loan centre for students, full of the latest high-spec cameras so don’t worry about not owning the latest model – we do! We were one of the first UK institutions to launch a photography degree and boast over half a century of heritage in photographic education. You’ll draw on that proud tradition while working at the cutting edge of technology. You’ll learn from experienced professionals and tutors of the highest calibre, using extensive industry-standard studio, darkroom and digital facilities. Live briefs set by external clients, gallery visits, overseas study trips, exhibitions, festivals and competitions will bring an exciting dimension to your studies. This course is centered upon your development as a well-informed and highly creative photographer. You will be encouraged to challenge conventions, break moulds and create your own photographic identity. Our graduates have gone on to be artists, academics, teachers and curators. 100% of our graduates are in work or further study within six months of completing this course (HESA 2016). The BA (Hons) Photography course values and encourages imaginative and inventive approaches to photography and supports all types of work, including black and white, colour and digital. You'll learn through a combination of lectures, technical workshops, seminars, group critiques and individual tutorials. You'll also go on regular gallery visits and be able to hear high profile guest lectures regularly. The BA (Hons) Photography degree finishes with a professional final exhibition at our degree show, where you'll have the opportunity to make vital industry contacts at the Private View evening. You could also continue your studies by taking our MA Film and Photography course. Please note, minimum entry criteria includes everything in an application, including a strong personal statement, a good reference and where asked for, a portfolio. Some students will get the opportunity to exhibit at Format, one of the UK's leading international contemporary festivals of photography and related media. Take a look at BA (Hons) Photography graduate Danielle Shambley's final project, 'Eructate: The 90th Year'. This course gives you a head start if you’re looking for a job in the image industry or planning to work on a freelance basis. Our graduates pursue career paths in fashion, advertising, documentary, editorial, and landscape photography, or picture re-touching and manipulation. The course has been written and designed in order to provide you with a comprehensive and in-depth understanding of the ideas, creative applications and potentials for photography today. The course values and encourages imaginative and inventive approaches to photography and supports work across a wide range of lens media, including analogue, digital and time-based practices. You will gain a thorough grounding in both technical skills as well as the historical, theoretical, cultural and political debates surrounding lens-based media. The Stage One modules will also help you orientate yourself in our department and allow you to become familiar with the staff and facilities available to you throughout your studies on the programme. You will continue to develop your skills to a higher level, exploring interdisciplinary methods of working. Fieldtrips, visits to exhibitions, guest speakers and an introduction to photography networks will provide specific contact points with the industry. A key aspect of Stage two is the development of you identity as a well informed and highly creative image maker. The focus is on establishing your own direction as you prepare for your final BA (Hons) Photography degree show in Derby. In addition, students’ work has been exhibited in London and Hamburg Triennial of Photography. By the end of this year, you will be an independent and confident practitioner who can hit the ground running in your career. This course involves an inspirational combination of learning and teaching methods. Technical workshops will develop the full range of photographic skills, including black and white, colour, digital, CGI and 3D. There are also lectures to introduce new concepts and knowledge; seminars to enable group discussions; critiques for constructive feedback; small group tutorials to encourage the development of ideas; individual tutorials to monitor your progress and clarify your artistic direction; group research activities to encourage team working; and individual presentations to help you develop communication skills. Your learning will be supported by a programme of guest lectures, contact with our high-profile visiting professors, regular gallery visits, and the chance to take part in prestigious competitions and festivals. These include the acclaimed FORMAT International Photography Festival which is hosted and organised jointly by the University and QUAD. You’ll also benefit from our partnerships with various leading professional organisations and employers. These pave the way for you to go on study visits, gain work experience, and contribute to live briefs. We have links with the Association of Photographers, the Artist Information Company, Artquest, Troika Editions, The Photographers Gallery, The Observer Newspaper, Derby Museum and Art Gallery, Magnum, MAC Birmingham and Print Space, to name but a few. The course culminates in a professional final exhibition at our annual Big Show, where you’ll also have the opportunity to make vital industry contacts during the private view. Assessment is by 100% coursework: your submissions of photographic work will be supported by an artist’s statement and opportunities to discuss the progression of your projects. Recent years have seen significant developments in the imaging sector, thanks to the growth and speed of digital technologies. At Derby, you’ll be equipped to harness both new and existing technologies in our high-specification facilities. 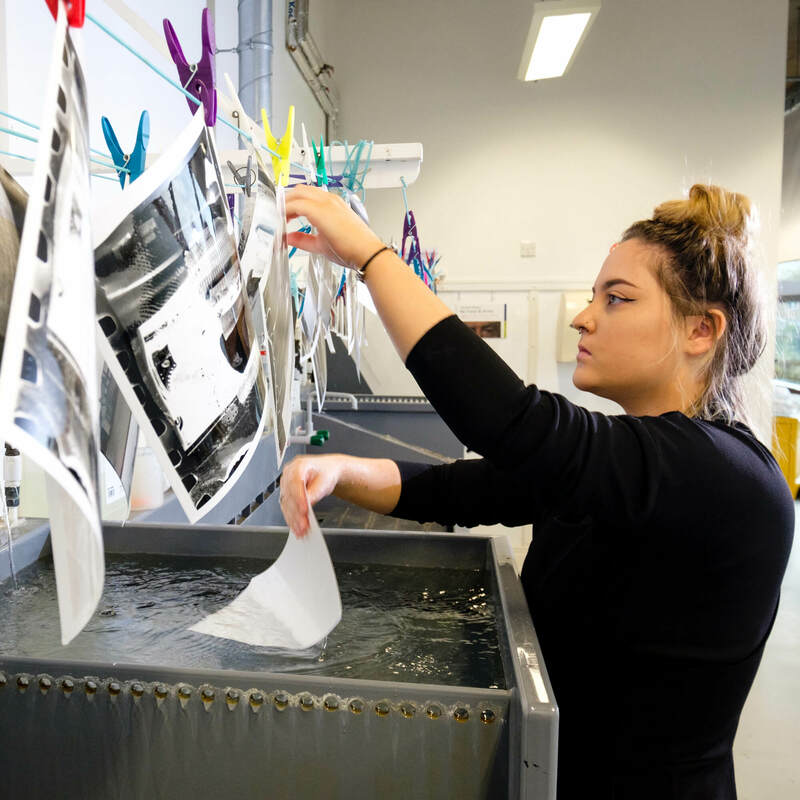 You’ll hone your skills in an excellent learning environment featuring extensive photographic studios, black and white and colour darkrooms, film processing facilities, dedicated digital suites, and Mac suites offering industry-standard software. We also have a bureau for professional printing of high-quality colour-accurate images and a well-stocked equipment centre from which you can loan an array of specialist resources. By the time you graduate, you’ll be a visually literate, independent, confident, articulate and adaptable photographer. Because the course also places emphasis on analytical, writing, oral communication, teamwork and problem-solving skills, you’ll be well equipped for diverse roles across the photo-imaging sector. Our graduates have gone on to become artists, academics, teachers, curators, critics, commercial photographers, picture editors, and news and sports photographers. Some receive major accolades for continuing the creative practice they started on their course. Josh Cole, BA (Hons) Photography graduate, who began photographing DJs, recording artists and dancers during his studies, went on to win a top prize at the UK Music Video Awards for his work on Rudimental’s single Not Giving In. We also provide support for graduates starting out in the creative industries, through our incubation unit – Banks Mill. It offers studio workspace and business development activities within a vibrant and thriving community of artists, designers and makers. In addition, there is the option to take your skills to the next level on our MA Film and Photography.